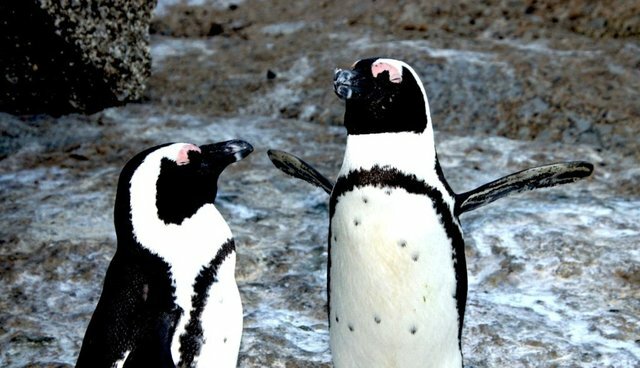 Researchers from the University of Turin (Italy) have discovered that captive African penguins, AKA jackass penguins, have a rather complex vocal repertoire. While their vocal stock is not as sophisticated as song birds, these lovely birds, who only live in South African waters, are able to pack a lot of information into their calls. [A] contact call emitted by isolated birds, an agonistic call used in aggressive interactions, an ecstatic display song uttered by single birds, and a mutual display song vocalized by pairs, at their nests. They also discovered two other distinct vocalizations, namely begging calls emitted by nesting chicks (begging peep) and unweaned juveniles (begging moan). The reason these penguins are called Jackass penguins is because their ecstatic display song that they use to attract mates sounds like the grunts that donkeys make. I just wanted to provide a heads-up about this study because many people are unaware of the magnificent penguin species with whom we share our planet and their very interesting behavior. The more we learn about these and other fascinating animals the more likely we will try to preserve their habitat and attempt to coexist with them. Years ago I had the wonderful opportunity to study Adélie penguins living at Cape Crozier, Antarctica, and I was amazed at the complexity of their behavior including the development of grooming patterns that are vital for maintaining the integrity of their feathers and how they survived despite intense predation by South Polar Skuas. This experience, in what was then one of the most remote places on earth, sensitized me to the interconnectedness of global ecosystems and just how fragile webs of nature can be. It also made the world seem like a much smaller place, though getting in and out of the field was quite the journey. And, of course, because it is now rather easy to travel to previously distant and remote areas, we need to be very careful not to intrude into the lives of animals who have enjoyed an existence with little human contact. Note: The title for my piece comes from this summary of this study.